A given parallelogram has a base in length, a height in length, and a side of length opposite the height. What is the area of the parallelogram? A parallelogram has a height of in length, a side of length opposite the height, and a base of . What is the area of the parallelogram? Given base and height , . A parallelogram has a base of length , a height of length , and a side of length . What is the area of the parallelogram? 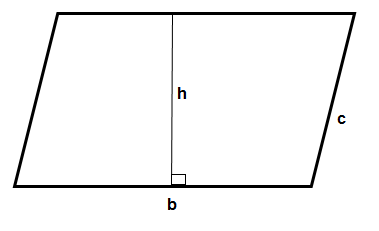 Find the area of a parallelogram with a height of , a base of , and a side length of . 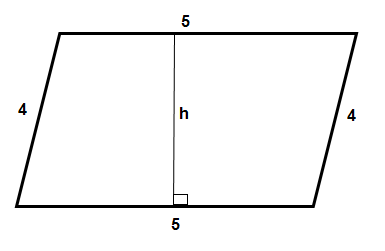 Find the area of a parallelogram with a height of , base of , and a side length of . Note: The formula for the area of a parallelogram is . 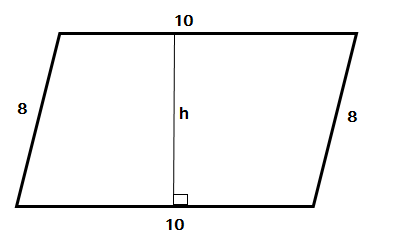 The base of the parallelogram is 10, while the height is 5. Find the area of the given parallelogram if . In order to find the area of a parallelogram, we need to find the product of the base length and height. Notice that only two of the given values were needed to slove this problem.